Before the Great Heathen Army descended upon the East Midlands in the late ninth century, the area was known as Mercia, a kingdom controlled by the Anglo-Saxons. Anglo-Saxon stone sculpture is scattered across this landscape. On Monday 17th July members of the Centre for the Study of the Viking Age set out to explore some of this stone sculpture. The first stop was St Helen’s Church, Stapleford. In the churchyard sits the Stapleford Cross (800 to 850 AD). It is a looming cross shaft engraved with an image believed to be of the Archangel Michael. Michael with his halo and wings holds a spear and stands upon a slain serpent. 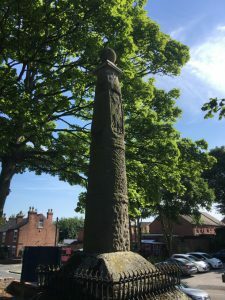 The cross is said to be ‘by far the most important pre-Conquest monument in Notts’ (Pevsner 1951: 336). Breedon Priory can be seen resting on a massive hill from miles away. It is no wonder that the place-name Breedon on the Hill is composed of the Celtic element breg ‘a hill’ combined with Old English dūn ‘a hill’ and the later affix ‘on the Hill’. That’s right the place-name means hill hill on the hill! Breedon Priory (founded originally as a monastery in the seventh century) is home to a large collection of Anglo-Saxon stone carvings and features some of the oldest surviving Anglo-Saxon pieces. Discover beasts, birds, vines, Celtic design, and religious figures plastered into the walls during one of the church’s restorations. Next we visited All Saints Church, Bakewell. Anglo-Saxon stones are stacked upon each other in all areas of the church. One block is carved with the Borre ‘ring chain’. The Borre style is unequivocally Viking in origin and the ‘ring chain’ is ‘remarkably uniform wherever it is found’ (Wilson and Klindt-Jensen 1980: 88). Could this suggest that a Viking craftsman was amongst the Anglo-Saxons in the East Midlands? Another potential ‘Viking’ find is on an Anglo-Saxon Cross. It has been suggested that this carving is Odin on his horse Sleipnir with the mythological squirrel Ratatosk below. However, this horse only has four legs and Sleipnir had eight, which indicates that this interpretation may not be correct. 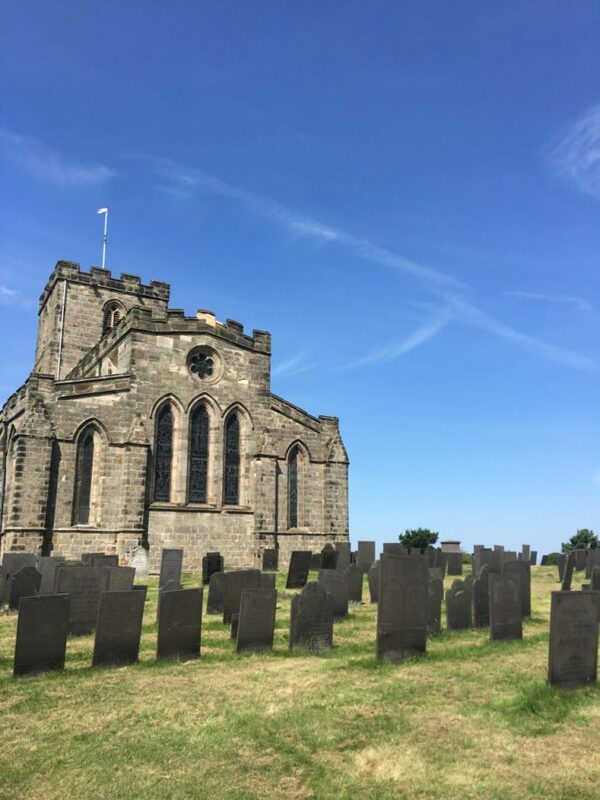 The last stop on our tour was St Mary’s Church in Wirksworth, Derbyshire. The church is known for the Wirksworth Stone, an Anglo-Saxon coffin lid, illustrating the lives of Christ and the Virgin Mary. 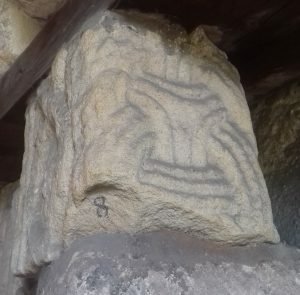 There is also a stone affectionately called by the locals ‘T’owd man’ which is reputedly the oldest Anglo-Saxon depiction of a miner. Stay tuned for more blog posts about CSVA excursions and Bringing Vikings Back to the East Midlands. Wilson, D.M. and Klindt-Jensen, O. (1980). Viking Art. 2nd edn. London: George Allen and Unwin. Pevsner, N (1951).The Buildings of England: Nottinghamshire. Harmondsworth: Penguin Books. Key to English Place-Names (KEPN) (2017). Key to English Place-Names [Online]. Available from: http://kepn.nottingham.ac.uk/ [Accessed 25 July 2017].